1912; canvas, oil; 89 x 98; State Tretyakov Gallery. Still lifes Alexander Vasilyevich Kuprina is distinguished by an elaborate composition. All items are selected and arranged so as to create a harmonious consonance of form and color. Not random chaos, but ideally ordered, diligently verified order of the beauty of everyday things. 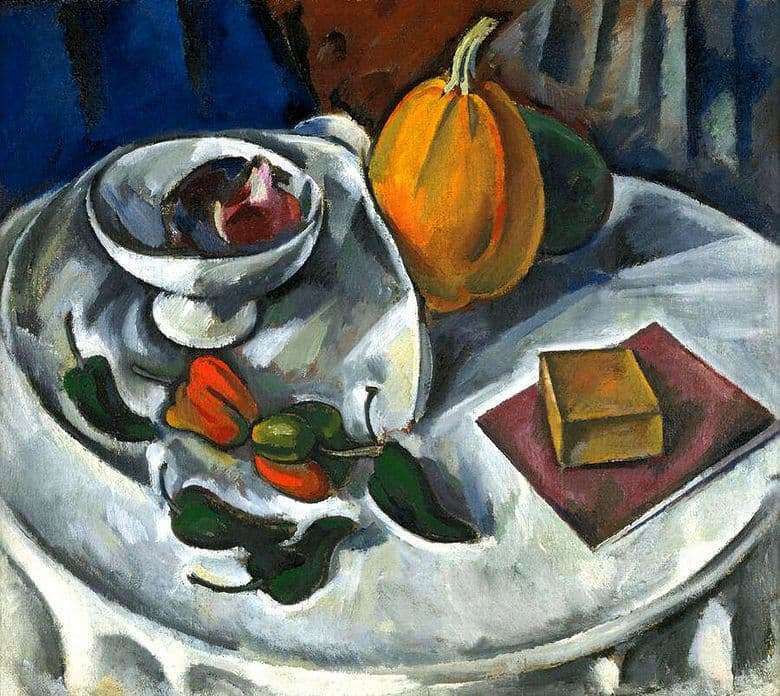 In the autumn “Still Life with a Pumpkin” is superbly noticeable. The main character of the picture, a reddish juicy pumpkin, lurked closer to the background, modestly hiding behind a fold of drapery canvas. Behind her is the lower part of the green oblong fruit. The elongated elegant shape of both pumpkins echoes the peppers in the foreground, and the colors are similar: rich green and red, but darker than the skin of the pumpkin, giving away almost brown. It is noteworthy that the game of colors arises crosswise. In the same way as peppers and pumpkin opposite to each other in a vertical line, they play in shades of claret-pink fruit in a round white vase, elements of the background, a bright color spot on a white tablecloth in front. The choice of white as the leading color design can not be random, it all so vibrant and easy to play all the shades of autumn. Still life has a depth of space, all objects are voluminous, material, dense.